Disclaimer: Web Shepherd does not give individual financial advice. Although the principles described below have achieved positive results for many, or at least I think they have, no guarantee of results is expressed or implied. Your results may vary. Secret number 1: Make money honestly. Note: If you have inherited wealth or a trust fund or your parents give you a lot of money, this secret may not help you, but you still may benefit from learning secret number 2. 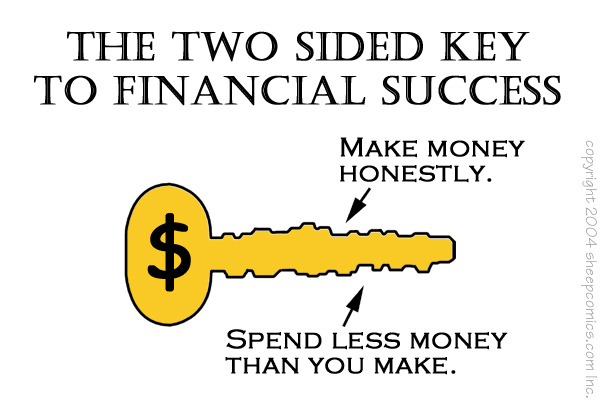 Secret number 2: Spend less money than you make. 1. 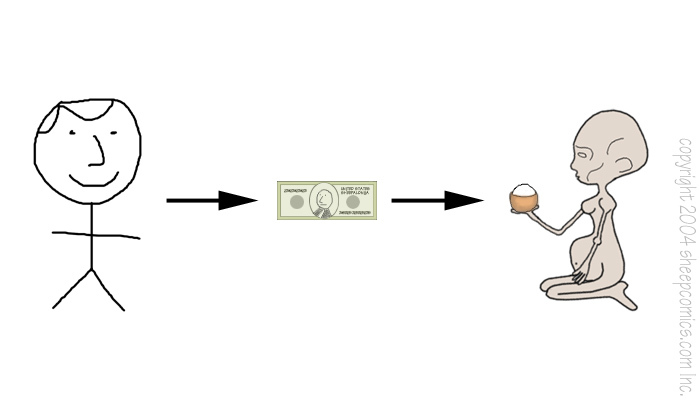 What they often don't teach you in college about making money. College degrees typically require a few thousand hours of work and more than a few thousands of dollars. 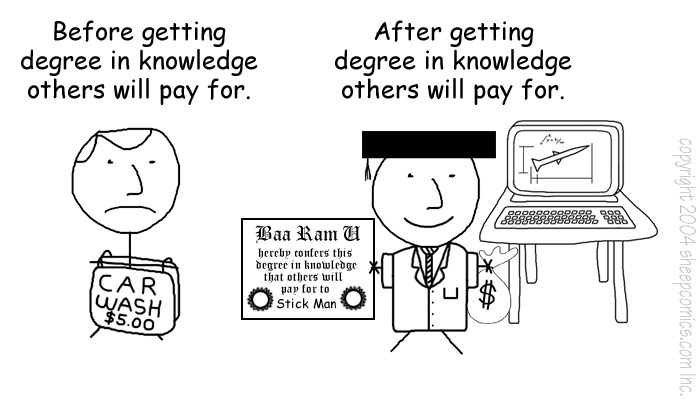 Some give you knowledge that others will pay for, and some do not. 2. What they often don't teach you in church about stewardship. The profound mystery of stewardship known to so few is that giving money to a church and giving money to God's purposes are not one and the same! They are only one and the same if the church you give to spends the money on God's purposes. God's purposes are revealed in the Bible. It is a good idea to study this for yourself, but the graphic below will help you understand one of the hidden mysteries of stewardship. All text and images ©1999-2004 Sheepcomics.com Inc. All Rights Reserved. Sheepcomics.com Inc. owns all rights, titles, and interests in and to the characters/creations "Sheepalonia", "Meadowfield", "Meadowbig Mainstream Church", "Lionel", "Dr. Flockshorn", "Rambro", "Baabaa", and "Eunice", and all other characters featured in Sheep Comics and all intellectual property or other proprietary rights therein. Any similarity to actual persons or sheep living or dead is purely coincidental. 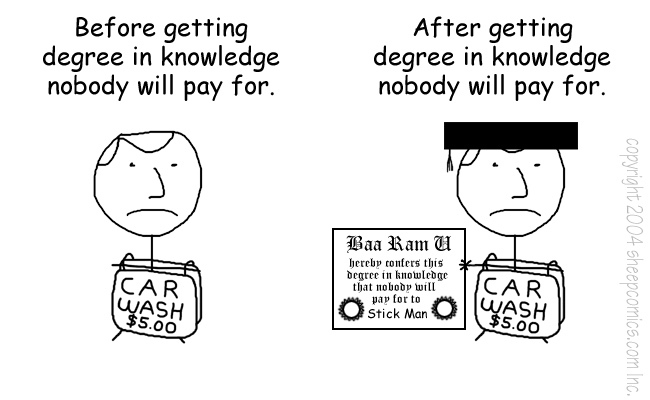 Republication or redistribution of any Sheepcomics.com content is expressly prohibited without the prior written consent of Sheepcomics.com Inc.